For decades, the World Bank followed a simple formula. Developed-world governments that are the bank’s members provided the bulk of its money, which was used to make loans to developing nations for infrastructure projects and the like. But that model is under strain. Some 1.3 billion people still live in extreme poverty, and the bank’s war chest is dwarfed by the funds pouring into developing countries through financial markets. Perhaps most important, the World Bank’s biggest benefactor and largest shareholder — the United States — has become its most trenchant critic. Mr. Kim’s mission is to revitalize the World Bank by increasing its firepower and winning over the United States. To do so, he is fundamentally, and controversially, changing how the bank operates. Instead of relying solely on contributions from reluctant donor governments, he is pushing private investors — sovereign wealth funds, private equity firms and insurance companies — to pony up trillions of dollars for projects in Indonesia, Zambia, India and elsewhere. His pitch: They can reap rich returns by putting their money to work alongside the World Bank. So instead of visiting villages, Mr. Kim tours financial capitals, hobnobbing with chief executives, bankers and fund managers. Interest rate swaps, internal rates of return, first-loss debt instruments: the jargon rolls off his tongue with the fluency of an investment banker. In December, at an environmental summit in Paris, he used the phrase “deals on the table” seven times in an eight-minute speech. During the address he promoted four World Bank projects that would use private-sector capital. World Bank traditionalists are squirming. “It is not enough to be just another private equity fund,” said Scott Morris, a former United States Treasury official who worked with the World Bank, now at the Center for Global Development. The World Bank was founded at the end of World War II, part of an effort to remake the international financial system in a free-market mold. Through subsidized loans, the goal was to stimulate recovery in ravaged Europe and, later, economic development in the world’s poorer parts. The dams, pipelines and roads that these loans built spurred progress. They also stirred controversy when the bank was criticized for environmental destruction and supporting despots. Along the way, an entrenched bureaucracy of economists and development experts took shape. Resistant to change, they sustain and defend the bank’s original mission: funneling loans to emerging economies. The son of Korean immigrants, Mr. Kim worked in the slums of Haiti and Peru, guided by the liberation theology of Catholic priests and the outrage of leftist intellectual Noam Chomsky. Unlike past World Bank presidents, who hailed from politics and finance, Mr. Kim’s background — as a public health crusader and a vocal critic of the bank for imposing heavy-handed solutions on poor countries — made him acutely aware of the institution’s frailties. After taking office he immediately embarked on a reform plan. Via the International Finance Corporation, which is its private sector lending arm and provides cash to companies in exchange for equity stakes, the World Bank currently drums up more than $7 billion a year to invest in ventures in the developing world. Mr. Kim wants that figure to increase eventually to $40 billion. In 2016, the bank announced a $5 billion deal to raise cash from insurers like Allianz and Prudential for a vehicle that would invest in infrastructure projects. The World Bank promised to protect investors against some losses. There has been a $500 million bond offering and derivatives offering to fight disease outbreaks. The bank formed a $1 billion partnership with private-equity firm Apollo Global to buy debt in developing countries. Mr. Kim is creating a venture with Credit Suisse to let clients invest in certain World Bank projects. And money is being raised for a $2 billion fund, managed by Amundi, the French investment giant, to buy bonds that finance environmentally friendly projects. Mr. Kim is conducting this experiment at a perilous time for the institution. The United States government is the bank’s largest shareholder, with a 16 percent stake. Under President Trump, it has been openly skeptical about the bank’s mission. And Adam Lerrick, Mr. Trump’s nominee to be a deputy under secretary responsible for the relationship with the World Bank, was a leading contributor to a study that questioned the relevance of the institution. The argument was that growing investment flows into developing countries rendered World Bank lending mostly superfluous. Nearly 20 years later, the report’s critique remains pointed. Last year, the World Bank dispensed $61 billion in loans and investments. By contrast, investors now inject more than $1 trillion a year into emerging markets, financing every manner of corporate or government investment. That is more than the $900 billion the World Bank has doled out in its history. It was 8 a.m. at World Bank headquarters in Washington, and Mr. Kim took his seat at the boat-sized table that dominates the bank’s board room. Its vast length evokes a more majestic time for the bank, when its voice — and loan book — loomed large across continents. Mr. Kim, 58, was on a video feed, urging financiers in Egypt, Jordan and Tunisia to put more of their own money to work in local markets. In effect, he was pitching the bank’s services as a middleman, ready to back projects with guarantees and other incentives. No longer could the World Bank be the sole provider of loans, which, he said, are “crowding out” the private sector. Mr. Kim is, by nature, a cheery person, but there was no mistaking the edge to his voice when he started talking about the World Bank economists whose pay is tied to how many loans they churn out. In his view, the bank needs to reward staff, Wall Street-style, for devising innovative financial solutions. Like others before him, Mr. Kim came to his job at the World Bank with bold plans to attack the institution’s bureaucracy. For most of his first term, which started in 2012, following a short stint as the president of Dartmouth, he was consumed by an unpopular reorganization. There were layoffs and bitterness in many areas of the bank. Those tensions are lingering. On Wednesday, the bank’s top economist, Paul Romer, abruptly resigned. Brought in by Mr. Kim a little over a year ago, Mr. Romer ruffled feathers by criticizing the quality of the bank’s voluminous economic reports. His end came after he claimed, in an interview with The Wall Street Journal, that the World Bank’s closely-watched report on business conditions in different countries had been altered for political reasons. President Barack Obama, in 2012, announcing his selection of Mr. Kim to lead the World Bank, with Hillary Clinton, then the secretary of state. For Mr. Kim, his vision of the bank as an institution more closely resembling Wall Street poses his biggest challenge. Dominated by economists from the public sphere, the bank tends to see private sector solutions — those involving the profit motive — as morally questionable. Mr. Kim is looking to change staff behavior with positive reinforcement. On the video call, he singled out a lending executive who, instead of simply signing off on a World Bank loan to help Jordan build an airport, created a package that relied heavily on private sector finance. Mr. Kim’s public criticism of staff has struck a nerve. Mr. Kim’s advisers say morale at the bank is improving and that the work force understands the importance of luring more private sector cash. But Mr. Kim’s motives are more complex than keeping employees happy or even finding the best financial solutions for poor countries. He needs to win over the Trump administration — a task he has attacked energetically. When talking about his relationship with the administration, he drops the first names of White House players. “Ivanka, Jared, Gary Cohn, Dina Powell — they all know our business model very well,” Mr. Kim said. His biggest coup was persuading Ivanka Trump, the president’s daughter and senior adviser, to back the Women Entrepreneurs Finance Initiative, which the bank introduced last October and that has raised $340 million. World Bank staffers sniff at the project, which they have nicknamed the Ivanka Fund. Outside the institution, however, the project was seen as a savvy move by Mr. Kim to outflank his critics at the Treasury Department. In his few meetings with Mr. Trump, Mr. Kim has tried to present the bank as a tool to enhance the administration’s “America First” policy. That could mean generous loans to strategically important countries or even providing expertise for United States infrastructure projects. Mr. Kim is trying to build support for his private-sector emphasis through public speeches. Ever the salesman, he tells the story of the bank’s need to embrace radical solutions as an extension of his own personal journey. He was the son of parents who escaped the ruin of the Korean War. They eventually settled in Muscatine, Iowa, where Mr. Kim was a high school quarterback before going on to Brown and securing advanced medical and anthropology degrees from Harvard. While at Harvard, he helped found Partners in Health, a nonprofit that devises treatment strategies in some of world’s poorest countries. Mr. Kim publicly jokes about ending up at the World Bank after criticizing the institution for being a bureaucratic behemoth, out of touch with the needs of the destitute. He devoured Marx as a young man, he likes to tell audiences. Now he takes counsel from — and socializes with — private equity titans Leon Black and David Rubenstein. Mr. Kim, right, with David Rubenstein, a founder of the Carlyle Group, the private equity giant. “Jim has a lot of credibility with private equity firms,” said Mr. Rubenstein. Some critics at the bank think Mr. Kim has become too dazzled by bold faced names and billionaires. He golfs (very well, by all accounts) with Michael Bloomberg — who has backed several projects at the bank and hails Mr. Kim as a “doer” — and swaps books with President Emmanuel Macron of France, most recently sending him a copy of “Orientalism,” Edward Said’s critique of Western attitudes toward the Middle East and Asia. Mr. Kim’s turn at the Paris environmental summit in December was an opportunity to trumpet the potential of his reimagined institution. The World Bank has been trying to shed its less-than-green image, and it was a main sponsor of the event, held on an island in the Seine. Mr. Kim had promised Mr. Macron that he would announce some eco-friendly deals. The day before, Mr. Kim had been in Zurich with Tidjane Thiam, chief executive of Credit Suisse, pitching clients on a new emerging market fund. 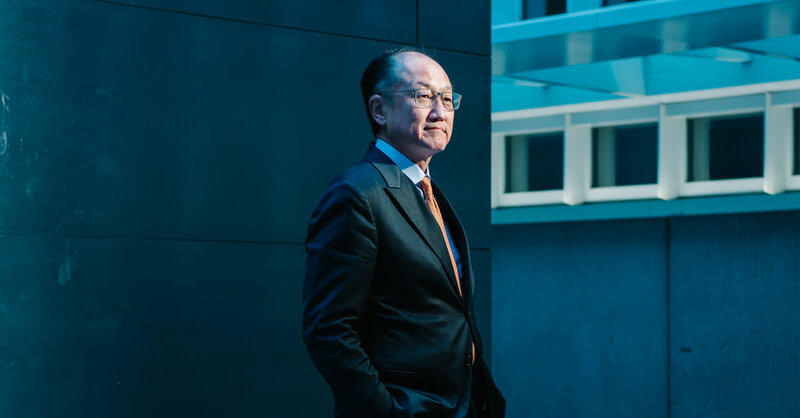 And after wall-to-wall meetings at the Paris conference, he planned to fly to Tokyo to sell investors on the World Bank’s latest financial innovations. His voice was hoarse; hectic travel and speechmaking had taken their toll. But now, with Mr. Macron and 50 other heads of state, not to mention Arnold Schwarzenegger, Sean Penn and Bill Gates, watching him closely, it was showtime. Mr. Kim strode onstage and started talking deals. There was a bid to attract $2 billion in private capital to protect coastal shores in West Africa; a $4 billion scheme to back geothermal energy in Indonesia; the establishment of a global investment bank to spur environmentally friendly investments in cities; and a big bet on electric cars in India. All would be blessed by the bank. But their ultimate success would hinge on how much money the private sector would kick in. Mr. Kim concluded by announcing that the bank would no longer back oil and gas drilling projects. A roar of applause filled the auditorium. Mr. Kim grinned. For the moment, at least, the World Bank was relevant again.